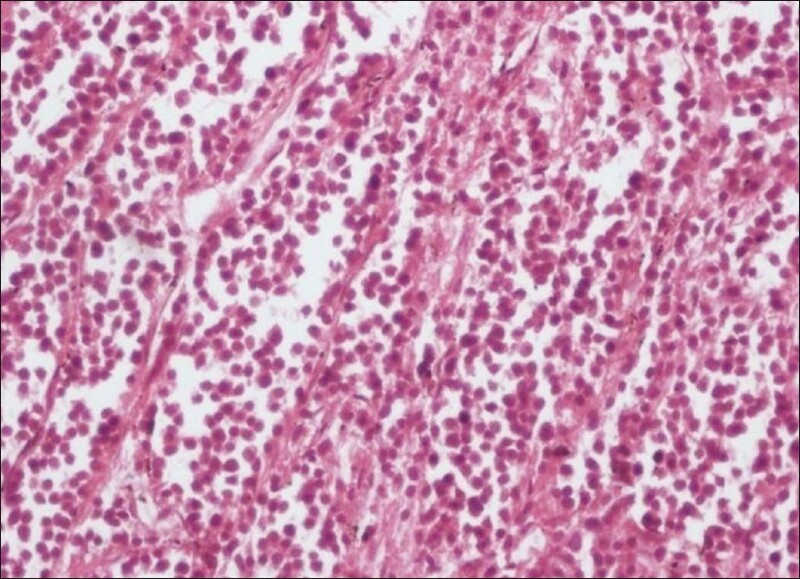 Congenital extraskeletal Ewing's sarcoma is a rare highly malignant small round cell tumor histologically similar to skeletal Ewing's sarcoma. Extraskeletal Ewing's sarcoma commonly affects the extremities, pelvis, and soft tissues of the trunk and it's extremely rare in neonates. In large series of study by Maygarden et al, only 2.6% out of 734 patients with Ewing's sarcoma were younger than three years old and mainly involved the skeletal system. This case is presented because of its rarity. A 20-year-old primigravida was being followed-up at routine antenatal clinic. The prenatal ultrasound studies were normal at 18 weeks of gestation. The conventional ultrasound at 31-32 weeks showed a single viable fetus in cephalic presentation with large solid cystic mass with fine septa located on the right side of the fetal trunk, measuring 16 x 13 x 9 cm. The lesion extended from the posterior axillary line and occupying the entire chest wall deforming the chest cavity and the diagnosis of lymphangioma was entertained. To assess the connection of the mass with adjacent structures more precisely, fetal magnetic resonance imaging (MRI) and TIFA (targeted image for fetal anomaly) scan was performed. The lesion was solid cystic and gave a high signal on the T2-weighted images suggesting the diagnosis of lymphangioma. No other congenital anomalies were detected. The mother was informed about the lesion and she continued with the pregnancy and delivered a female baby vaginally at 34 weeks of gestation. The Apgar score of the baby was four at birth and died within two minutes. There was no history of consanguinity or malformation in the family. The baby was referred to pathology department for fetal autopsy from the department of obstetrics at our institute. Her birth weight was 2250 gm with a large mass on the right side of the chest occupying the entire chest wall, measuring 15 x 12 x 8 cm. [Figure 1] and [Figure 2] The mass was compressing the rib cage without destruction of the ribs. The skin over the chest wall was normal. Grossly, the tumor was circumscribed and the cut section was solid gray white. Microscopically, it revealed sheets of densely packed dark cells separated by fibrous septa. 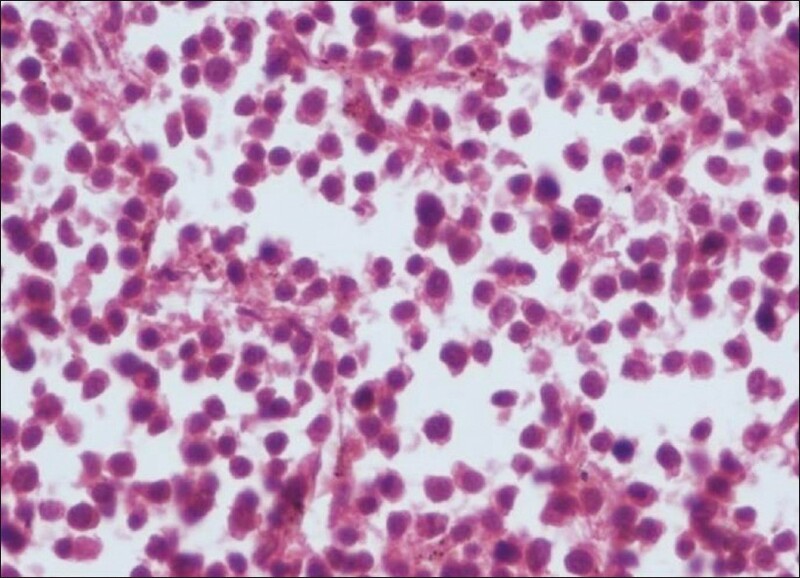 [Figure 3] The individual cells were small round with scant to moderate amount of cytoplasm, darkly stained hyperchromatic nuclei, and inconspicuous nucleoli. [Figure 4] The differential diagnosis of alveolar rhabdomyosarcoma, Ewing's sarcoma, neuroblastoma, and lymphoma were considered. 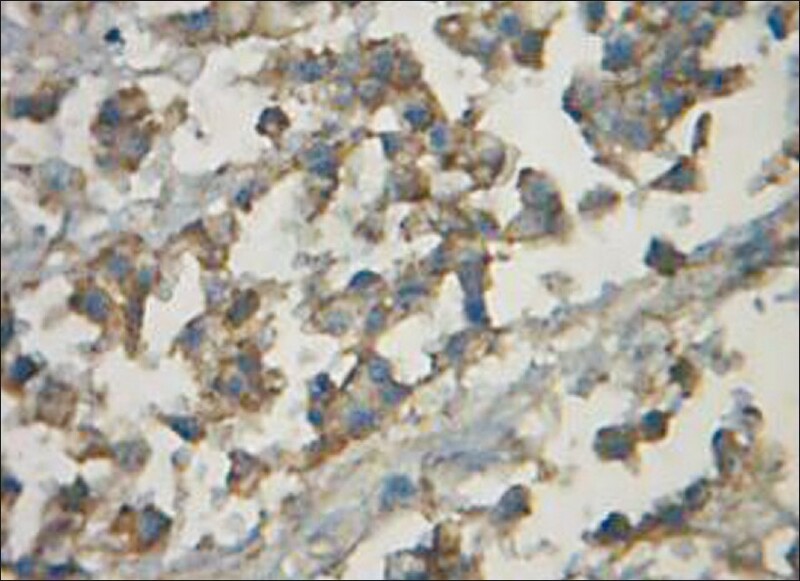 The tissue was subjected for immunohistochemistry. The tumor cells were positive for CD99 [Figure 5], negative for desmin, myogenin, synaptophysin, chromogranin, NSE and LCA. The final diagnosis of extraskeletal Ewing's sarcoma was made. Extraskeletal Ewing's sarcoma usually occurs in 10 to 30 years of age. The common sites include paravertebral and intercostal regions as well as on the lower limbs. Rarely, pelvic and hip regions are involved. It usually occurs in deep soft tissues and rarely involves dermis and subcutis. It is unusual in infants and toddlers. The lesion is usually detected by imaging techniques in the late middle or third trimester. In large series of study by Maygarden et al, only 2.6% out of 734 patients with Ewing's sarcoma were younger than three years old and mainly involved the skeletal system. Tatiana Karine Simon Cypel  reported a case of extra-skeletal Ewing's sarcoma in a great toe of a four year old child. Lim et al, reported the first case of congenital extra-skeletal Ewing's sarcoma of the face, the tumor arose from the medial aspect of the right lower eyelid, and Yusuke et al, reported congenital Ewing's sarcoma in retro peritoneum with multiple metastases. In Ewing's sarcoma, the most common cytogenetic abnormality (80%) is the translocation t (11; 22) (q24; q12) that juxtaposes the proximal portion of the gene EWS (22q12) into the distal portion of the gene FLI-1 (11q24). The result of the gene fusion is a chimeric transcript which acts as an aberrant transcription factor and promotes tumorigenesis. This can be detected by reverse transcriptase-polymerase chain reaction. The second most common translocation is t (21; 22) (q22; q12) in 10% of the cases. A third variant is t (7; 22) (p22; q12). In our case, chromosomal analysis was not possible due to lack of facilities. Congenital Ewing's sarcoma in neonates commonly involves the skeletal system. Extraskeletal Ewing's sarcoma in neonates is quite rare and this case is being presented because of its rarity. 1. Maygarden SJ, Askin FB, Siegal GP, Gilula LA, Schoppe J, Foulkes M, et al. Ewing's sarcoma of bone in infants and toddlers. A clinicopathologic report from the Intergroup Ewing's's Study. Cancer 1993;71:2109-18. 2. Hsieh HY, Hsiao CC, Chen WS, Lin JW, Chen WJ, Wan YL, et al. Congenital Ewing's sarcoma of the humerus. Br J Radiol 1998;71:1313-6. 3. Cypel TK, Meilik B, Zuker RM. Extra-skeletal Ewing's sarcoma in a great toe of a young boy. Plast Surg 2007;15:165-8. 4. Lim TC, Tan WT, Lee YS. Congenital extra-skeletal Ewing's sarcoma of the face: A case report. Head Neck 1994;16:75-8. 5. Saito Y, Matsuzaki A, Suminoe A, Koga Y, Kurata H, Oda Y, et al. Congenital Ewing's sarcoma in retroperitoneum with multiple metastases. Pediatr Blood Cancer 2008;51:698-701. 6. Carvalho C, Valette G, Nicolas G. Maxillary localization of a congenital peripheral primitive neuroectodermal tumor. A case report. Int J Pediatr Otorhinolaryngol 2006;1:27.